NASA's Curiosity Mars rover can be seen at the "Pahrump Hills" area of Gale Crater in this view from the High Resolution Imaging Science Experiment (HiRISE) camera on NASA's Mars Reconnaissance Orbiter. Pahrump Hills is an outcrop at the base of Mount Sharp. The region contains sedimentary rocks that scientists believe formed in the presence of water. The location of the rover, with its shadow extending toward the upper right, is indicated with an inscribed rectangle. Figure A is an unannotated version of the image. North is toward the top. The view covers an area about 360 yards (330 meters) across. HiRISE made the observation on Dec. 13, 2014. At that time, Curiosity was near a feature called "Whale Rock." A map showing the rover's path for the weeks leading up to that date is at http://mars.nasa.gov/msl/multimedia/images/?ImageID=6884 . The inset map at http://mars.nasa.gov/msl/multimedia/images/?ImageID=6913 labels the location of Whale Rock and other features in the Pahrump Hills area. The bright features in the landscape are sedimentary rock and the dark areas are sand. The HiRISE team plans to periodically image Curiosity, as well as NASA's other active Mars rover, Opportunity, as the vehicles continue to explore Mars. 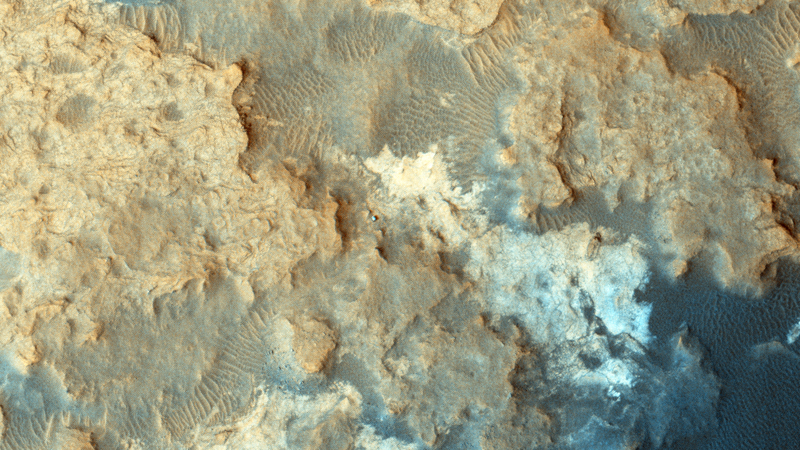 This image is an excerpt from HiRISE observation ESP_039280_1755. Other image products from this observation are available at http://hirise.lpl.arizona.edu/ESP_039280_1755 . This view from the left Navigation Camera (Navcam) of NASA's Mars Rover Curiosity looks back at wheel tracks made during the first drive away from the last science target in the "Glenelg" area. This mosaic taken by NASA's Mars Curiosity rover looks uphill at Mount Sharp, which Curiosity has been climbing. The heat shield for NASA's Mars Science Laboratory is the largest ever built for a planetary mission. This is a close-up of the area in the vicinity of the Pathfinder landing site. Major features are named. The white box outlines the area of the image, where hardware is seen.